Pricing information for the upcoming free-to-play Killer Instinct has emerged, and it looks like those of you who want to enjoy the game's full roster will need to earmark a sizable chunk of change. 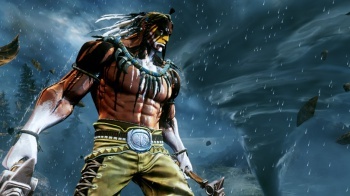 Killer Instinct has lain dormant since the mid-90s, but the upcoming Xbox One console sees the fighting series' return. Unlike past Killer Instinct titles however, this latest entry follows a free-to-play business model. Players will be able to download the game totally gratis with a single playable character, and if you'd like more, you're going to have to pay for it. According to a new post on the official Xbox Wire blog, each additional character you purchase will set you back $5. Of course, if you're willing to spend a bit more money, there are bundle packages that offer slight savings over picking up the game's roster piecemeal. The Combo Breaker Pack, which features a $20 price tag, offers players eight characters. That's a 50 percent discount, for those of you too lazy to do the math. Alternately, if you spend $40, you'll receive those eight characters, additional costumes for your fighters, character accessory packs and a copy of the original arcade release of Killer Instinct. It should be noted that this free-to-play model allows Microsoft and developer Double Helix to slowly roll out updates for the title. As such, if you pick up one of the bundles that offers eight characters, you'll find six of them available at launch, with an additional two arriving at some point in the future. The good news is that bundle owners will receive early access to these two additional fighters, though there is no word on when they might appear or who those characters might be. Thus, despite Killer Instinct being a free-to-play game, those of you who are hoping for it to be as full-featured as other modern fighting games will need to spend roughly as much cash as you'd expect to shell out for a standard retail release - and that's assuming Double Helix doesn't end up offering even more premium content after the title has hit virtual shelves.